On Monday, February 25, 2019, Governor Andrew Cuomo signed the Red Flag Bill into law at John Jay College of Criminal Justice. He was joined by many of his colleagues in New York State government, and Speaker of the House Nancy Pelosi to celebrate this new legislation, the first in the nation of its kind. His special guests, who helped give the bill a more heartfelt perspective, were Linda Beigel Schulman, who lost her son, Scott J. Beigel, in the Parkland, Florida school shooting, and Mark Barden, whose son, Daniel, was killed in the Sandy Hook school shooting. It’s no secret that New York Governor Andrew Cuomo is making it his mission to enact smart gun control legislation. After Sandy Hook, New York State passed the Safe Act, banning assault weapons, banning high capacity magazines, and extending background checks to private sales. “Sandy Hook was not the last. It was not an exception. In many ways it was only the beginning of a terrible scourge that went across this nation,” said Cuomo. “It's only gotten worse, one after the other, one more violent than the other. One more nonsensical than the other. And New York said no more, let's use common sense, and we passed the Safe Act, and the Safe Act made sense. Yes, people have a right to a gun if they are legitimate hunters and legitimate sportsmen, but not a person who is mentally ill, not a person who has a criminal background. 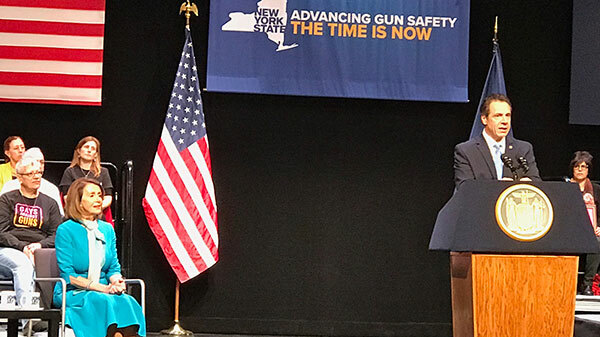 Why would you ever put a gun in their hand?” Cuomo went on to praise Speaker Pelosi for the work she’s already done, and is about to fight for, regarding gun control and closing up the national loophole that enables individuals to purchase guns privately or at gun shows without a background check. “It is a total loophole that swallows the law. The reality is, there is no background check in this nation if you want to buy a gun,” he explained. Then, to the delight of the crowd, she commented on the President’s emergency declaration. “Tonight, we're also going to the Rules Committee to put forth a resolution to overturn the President's declaration. Congressman Joaquin Castro, Chairman of the Congressional Hispanic Caucus, from Texas, a border state, is taking the lead on this,” said Pelosi. “This is not about politics. It's not about partisanship. It's about patriotism. It's about the Constitution of the United States of America.” She explained that at the heart of the Constitution is a separation of powers, with coequal branches of government, designed as checks and balances to each other. And for Pelosi, not putting forth this “check” on the Executive Branch would make her delinquent on her duties and her oath of office.